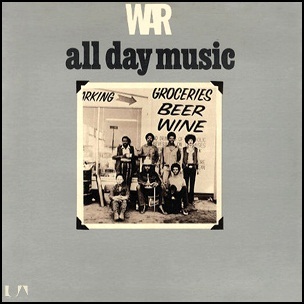 In November 1971, “United Artists” label released “All Day Music”, the fourth War album. It was recorded in 1971, at “Wally Heider Studios” in San Francisco, “Crystal Studio” in Los Angeles, and was produced by Jerry Goldstein, Chris Huston, Papa Dee Allen, Harold Brown, B.B. Dickerson, Lonnie Jordan, Charles Miller, Lee Oskar and Howard E. Scott. All tracks by Papa Dee Allen, Harold Brown, B.B. Dickerson, Lonnie Jordan, Charles Miller, Lee Oskar and Howard E. Scott, except where noted.